In the latest iteration of Advanced Gutenberg, we turn our sights towards organization. This time, the main actors are a new accordion block and the facility to separate content in tabs, alongside smaller introductions. Much of Advanced Gutenberg’s focus in recent months when it comes to content organization has revolved around new intuitive ways to convey your message. In version 1.5 of Advanced Gutenberg, the focus shifts towards a more obvious way of managing clutter - hiding it. 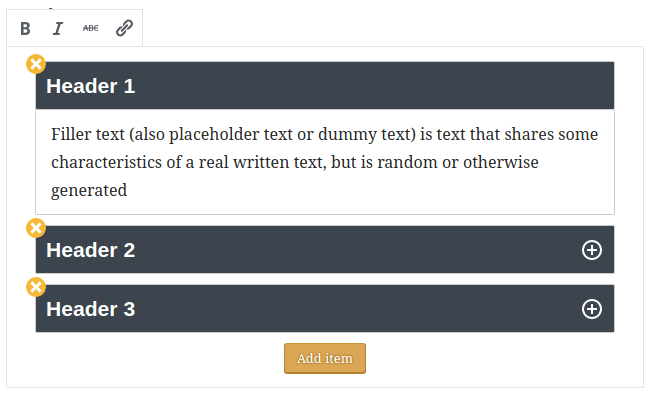 Two main solutions have been added to Advanced Gutenberg. The former is the accordion, a structure that can be opened and collapsed at will to show or hide content respectively. The latter is a tabular systems, where content is stored neatly in different categories. These options represent not only a way of grouping parts of content, but also a natural way for readers to move through content, hiding it when they are done with it. The accordion block expands and collapses at the user’s will to show or hide the content that it contains. With Advanced Gutenberg, you can define the content right inside the accordion. As you have become accustomed, the side-menu allows you to customize the look and feel of the block. The main options that are available to modify the accordion are the abilities to change the background color and border to make the block stand out or blend in with the rest of your WordPress blog. Other options allow you to choose the icon to use to indicate that the accordion can be opened or closed. The tabs block works similarly to accordions, but everything is organized horizontally within tabs, and in turn, each tab encapsulates within it textual blocks. Along the same vein as the accordion, the tab block can be modified by choosing the style of inactive and active tabs, text and borders alike. Moreover, like accordions, tabs can be added and removed at will. The main difference between the tabs and accordion blocks is that the tabular layout may be used to groups together inherently similar content, but splits them into more specific categories. On the other hand, the accordion can be used in more general cases to show or hide individual text blocks. Furthermore, whereas the vertical space taken by the first block depends on the number of accordions, tabs expand horizontally, with their vertical length depending only on the text content. Apart from organization, Advanced Gutenberg 1.5 provides another block that allows your readers to quickly follow your content on social media. The social icons block allows you to place social network icons right alongside your most engaging content. The block is called Social Links, and it lets you pick the social networks that you use. For each such network, you only need to define a link to your page. From the side menu, you can define the spacing between icons and their size. 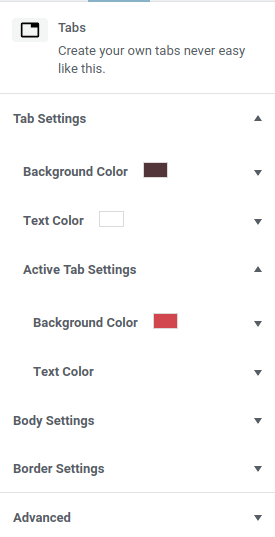 If minimalism does not work for you, you can also choose a unique color for each icon. Finally, minimalist blogs often include a lot of whitespace for an appearance of untarnished cleanliness and to draw maximal focus towards the content that is visible. 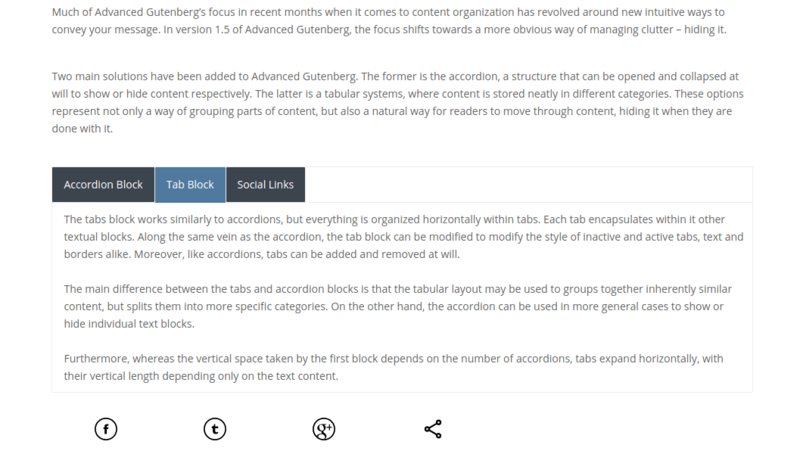 A new setting in Advanced Gutenberg 1.5 allows WordPress content creators to manually define the space between Gutenberg blocks to control the whitespace on posts and pages. This option can be enabled from Advanced Gutenberg’s settings page, under the Configuration tab. When the enable blocks spacing option is switched on, you can define the vertical margin between consecutive blocks, giving your posts and pages more breathing space. At times, organizing content can be as simple as hiding it. The main introductions to Advanced Gutenberg’s latest version embrace this ideal. In this way, the accordion and tab blocks let you control how you display your content, simultaneously giving your readers the key to manage the content that they are seeing.